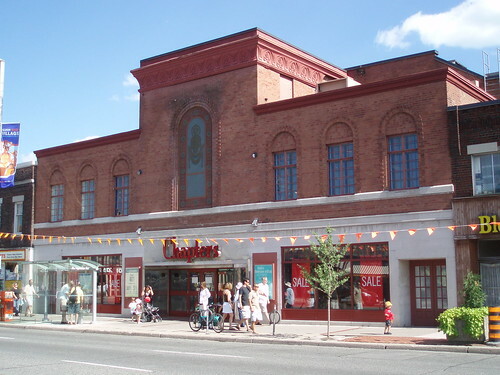 As a kid and teenager, the old Runnymede Theatre on Bloor Street was one of the two movie theatres I frequented. 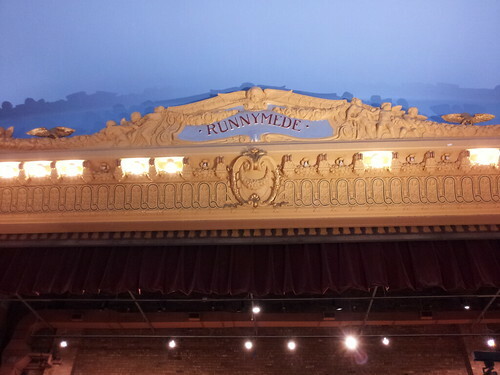 I wrote about my Runnymede Theatre memories seven years ago. When the theatre was closing, there was concern whether the new tenants would be able to preserve the history and beauty of this old vaudeville theatre. I was very pleased with the job Chapters did, as you'll see from these photos I took. Unfortunately, Chapters won't be renewing their lease and will be leaving this great historical space. 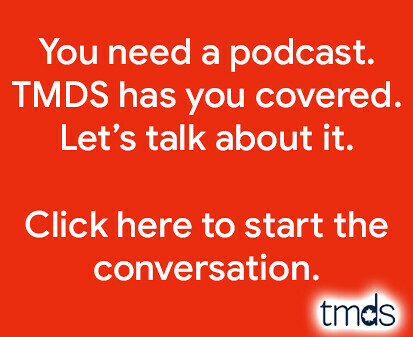 A Shoppers Drug Mart is moving in, and I worry about how they'll treat the great interior. It's maybe the third worst of the Chapters book stores I've been to (in West Toronto). The Indigo - Chapters below Bay and Bloor is by far the worst with its mid-level middle portion. And I consider the Eaton Centre's upper tier location just ahead of Runnymede's, but only because its up-escalator only floor design was a self-made mistake. Over half the time I browse or shop at the Runnymede location, I get caught up by whether this aisle or that aisle will allow me to access the main outer rampways. I always end up backtracking my way around. Give me the straight forward World's Biggest (former Bowling Alley) bookstore location every time! I don't know why Shoppers Drug Mart is moving in. They already have a decent sized nearby location, on the north side of the street. It is a funny neighbourhood; millionaire homes and a posh bookstore with an entrance water bowl for doggies, and yet tons of people going to a No Frills supermarket, just a block or two east of the bookstore, with a scattering of homeless people along the sidewalks. All the Bloor West stores are either one-way or the other, it seems. p.s. I sat through a movie at Runnymede once when I was a preteen. @ Mike You forgot to mention that for a few years it thrived as a Bingo Hall. I respectfully disagree. IMHO, this Runnymede Theatre Chapters is the most beautiful bookstore in the city. With regards to the No Frills, even people living in expensive neighbourhoods sometimes like to pay less for a can of peas. I saw many movies at this theatre. Me too. I grew up nearby and was born in '74. I never spent any time near Runnymede growing up in Toronto, but I was there a month or two ago wandering the Ukrainian festival while my wife was shopping, and decided to wander into the Chapters. I didn't notice anything special until I made it about half way into the store and it blew my mind. It was a genuine shock to see how wonderfully they had captured the building's history while re-purposing it as a book store. I was so amazed that when my wife was done I made sure she came to see the store as well. I can't figure out how a Shoppers can use as much space, so I'm worried about this news. I have 2 rows of 4 seats from the old theatre and the movie poster form the last movie that showed there. My wife and I saw the movie and then asked for the poster. I'll have to dig around the garage to see what it was, I have forgotten now. I loved the old retro movie theaters. I remember back when they had the "festival chain cinemas " (Runny wasn't part of it) but it was still cool that you can get a card and get discount price to any of the retro theaters locally. Does anybody remember that? That was about a decade ago. Does any one have any info re a local bowling alley existing until the Fifties? South side of Bloor and closer to Windermere. May have been called Runnymede Bowling. Does anyone have any info re a local bowling alley existing until the Fifties? South side of Bloor but closer to Windermere. It may have been called Runnymede Bowling.